Oooooh I’m in the Minority Report! This is officially the most exciting moment of my hobby as a writer. The Parliamentary Science and Tech Select Committee have published a very sensible report about the evidence for and against a change in the Abortion laws. The Minority Report is an extra report, bolted on as an appendix: they are there for when there are members of a select committee who don’t like the actual report. In the case of this Minority Report on abortion, it’s a rollercoaster ride of pseudoscience and dubious data, signed by one Tory MP with the support of one other, and I highly recommend giving it a read. I’ve posted the PDF here, until it appears on the parliament website. Ooh ooh I just got this in email at 00:01 and I hereby am posting it before the BBC or anyone. They lose valuable minutes by pretending not to copy and paste the press release, while I find that kind of theatre slightly childish. Meanwhile, pasted below is what our Parliamentary Science and Technology Committee on the Abortion Act recommended, after carefully reviewing the scientific evidence. The report itself is a masterful and surprisingly readable precis, which I’ll post as soon as the link goes live. Where do all those numbers in the newspapers come from? Here’s a funny thing. The Commons committee on science and technology is taking evidence on “scientific developments relating to the Abortion Act 1967”. A corporate conspiracy to silence alternative medicine? Danie Krugel is an ex-policeman in South Africa who believes he can pinpoint the location of missing people anywhere on the map. He does this by using his special magic box, which works through something to do with “quantum physics”, but you aren’t allowed to know any more than that: these are “complex and secret science techniques”, driven by a “secret energy source” driving a “matter orientation system machine“. By simply popping a strand of the missing person’s hair – or some other source of DNA – into his box of tricks, Krugel can pinpoint that person’s location, anywhere. Buy your Powerwatch goodies today! I thought I’d briefly share this email which just arrived. As you can see the Powerwatch/EMFields product range is expanding, and as they say, electromagnetic hypersensitivity has been officially recognised as a disability by the government. If you’re frightened about electromagnetic radiation you can pay £28 to subscribe to the Powerwatch website. 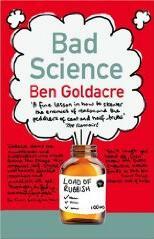 You can read badscience.net for free. Danie Krugel: can you please call me?